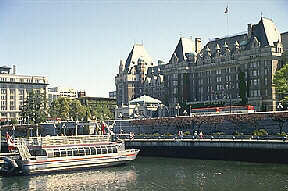 Dating back to 1843, the city of Victoria was first established by the Hudson's Bay Company as a fur trading post. 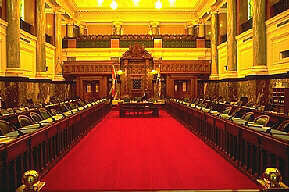 The province's capital since 1868, Victoria is situated on Vancouver Island. It's beautifully preserved Victorian heritage and First Nations culture may be found in the abundant museums, galleries, pioneer homes and turn of the century mansions scattered about the city. This busy seaport, with water on three sides, has a mild climate year-round with an annual rain fall of only 68cm (27in). 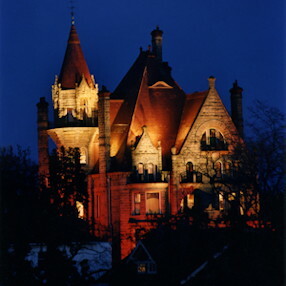 Located a short walk or drive from the downtown harbour, Craigdarroch Castle is a beautiful historic Victorian-era mansion, which was built in the 1890s by wealthy BC coal baron Robert Dunsmuir. There are 39 rooms, most of which are furnished lavishly in the style of the 1890s � 1900s period. With over 20,000 square feet of space, the house and gardens are being restored exactly as they were originally built, and you will find artisans working on restorations most days. These imposing buildings which house the British Columbia Legislative Assembly tower above the Victoria Harbour on Belleville Street. Atop the main copper-covered dome (1897) is a gilded statue of Captain George Vancouver, the city of Vancouver's namesake and the first European to circumnavigate Vancouver Island. This grand hotel was erected in 1908 by the CPR. Formal gardens, plush waterfront dining room, vine-covered walls and a conservatory complete with aviary make the Empress a pleasant place for high tea or just a stroll around the grounds. One of Canada's finest museums, the Royal B.C. Museum has an impressive collection of First Nations artifacts as well as a pioneer style fish cannery, sawmill, coal mine, a reconstruction of Captain George Vancouver's ship, the Discovery and an extensive natural history display. The museum is located at 675 Belleville Street. Admission is free on Mondays from October 1 to April 30. The Maritime Museum features splendid displays of nautical artifacts and maritime history including ship models, figureheads, bells and uniforms from various eras. It is located at 28 Bastion Street in what was the city's first courthouse, built 1889. Known to the Indians of Vancouver Island as 'Klee Wyck' - the Laughing One, this famous eccentric painter was influenced by the Impressionists and Canada's Group of Seven. Her bold style, which captures the mystical beauty of the coast, may be viewed at the Emily Carr Gallery at 1107 Wharf Street. Built in 1852, this pioneer home is one of the oldest standing in the province. Once the home of Dr. J.S. Helmcken, who helped negotiate B.C. 's entry into Confederation, this building is now a provincial museum with a display of colonial artifacts. Visit the beautifully restored 19th century buildings adjacent to the square which include the city's first jail and Provincial Court House. This is the site where Fort Victoria was established in 1843. Victoria's Chinese heritage dates back to 1858, which grew rapidly with the influx of Chinese labourer's who played a great role in the building of the railroad. Fan Tan Alley, once famous for its opium dens and gambling houses is now a centre for Chinese commerce and culture. The ornate Gate of Harmonious Interest with its hand-carved lions makes for a beautiful entrance to the west coast's oldest Chinatown. Rolling lawns, rose gardens, a cricket field and an outdoor theatre and art displays complete with a stunning view of the Olympic Mountains make Bastion Square a pleasant place to relax for the afternoon. View the impressive collection of First Nations totem poles, cedar dugout canoes and a 19th century Kwakiutl house. The styles within the park represent several of the Pacific coast tribes. Thunderbird Park is located at the corner of Belleville and Douglas Streets. Just west of Victoria Harbour entrance, is Esquimalt Harbour, home to Canada's Pacific naval fleet where visitors may see destroyers and the dockyard. This being an older section of Greater Victoria, there are several heritage buildings worth seeing. Occasional walking and water taxi tours are available.